Otherwise known as a Government Related Issuer (“GRI”), a Quasi-Sovereign entity is a company with full or partial government ownership or control, a special charter, or a public policy mandate from the national, regional or local government . By nature, these companies usually have strategically important roles, enjoy dominant market positions and are prominent issuers of debt within their respective markets. Examples include Petroleos Mexicanos (Mexico, 100% state owned), Gazprom (Russia, 50% state owned) and the Bank of China (China, 65% state owned). Although the bonds of many GRIs are not explicitly guaranteed by the government, they are generally considered safer than pure corporate credit due to implicit government support mechanisms. Consequently, this qualifies the bonds for higher credit ratings than what the standalone credit profiles would justify, to reflect the likelihood of extraordinary government support during an economic crisis for example. For those GRIs with high government support assumptions, bond valuations are principally driven by sovereign factors as opposed to credit fundamentals. Whilst this means they face greater exposure to sovereign risk, such as fiscal balances and upcoming national elections, they are generally less volatile than pure corporate credit. Developing countries have been the biggest driver of growth in the asset class, using the quasi-sovereign market as a new source of international funding and to help develop a hard-currency corporate debt market, with most issues denominated in US Dollars. For emerging market investors, they provide an opportunity to earn attractive yields, above that of government bonds, whilst being more defensive than pure-corporate EM bonds. Measuring the value of this risk can be done by analysing the spread (or yield pick-up) offered versus its sovereign. For example, a spread of 100bps (1% yield pick-up) may be a typical risk premium for a quasi-sov bond that has a high implied support assumption but no explicit government guarantee. If the bond valuation de-couples from the sovereign and the spread widens to 150bps, there may be some value to harness for investors. 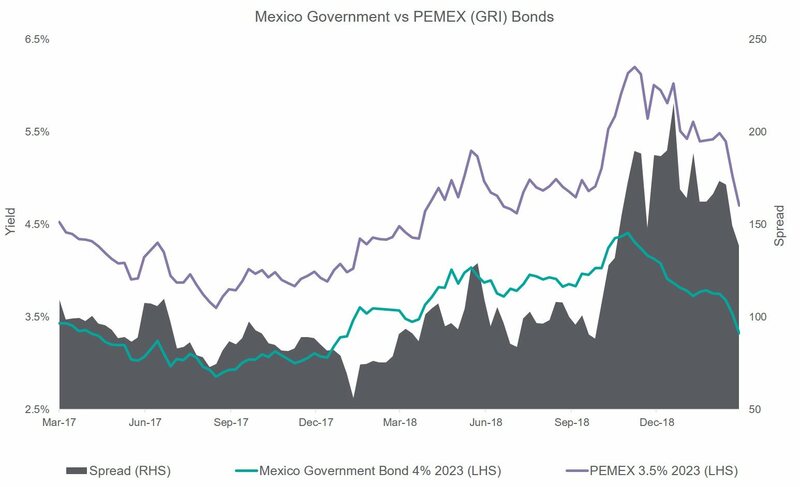 From the above example, the average spread of PEMEX to Mexico was 107bps since March 2017. When the spread reached above 200bps in January 2019, representing a significant disconnect between the GRI and the sovereign, a case could have been made that this was a good opportunity to invest, all else remaining equal. In summary, quasi-sov bonds offer investors a more cautious approach to investing in EM debt, closely aligned with the sovereign but generally with a yield premium to reflect their position as a corporate issuer. There are 3 key considerations before investing in these bonds however; (1) the standalone credit risk of the company; (2) the sovereign risk factors; and (3) the sovereign support mechanisms. The Waverton Global Strategic Bond Fund and Sterling Bond Fund have both taken positions in a variety of emerging market quasi-sov bonds over the last 12-months, seeing the defensive characteristics and geographical diversification as a key theme for investing late in the cycle, whilst still returning an attractive yield. The Inverted Yield Curve Part Two: Time to Batten Down the Hatches?